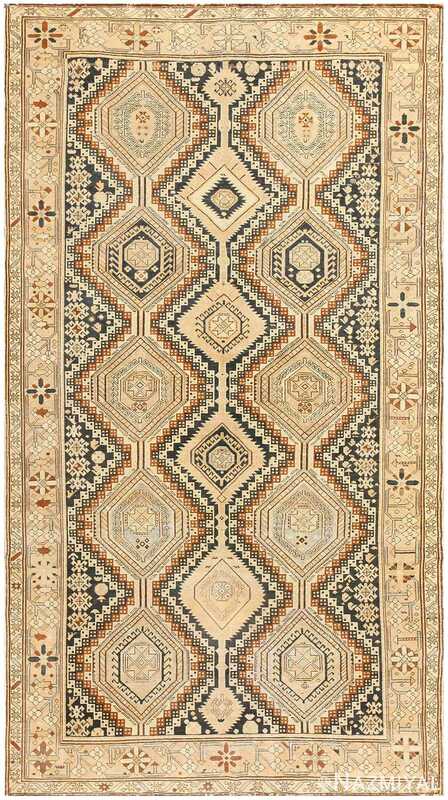 Grand symbol-filled medallions with poly-chrome accents are featured prominently as are all-over Afshan patterns, which are a sort of angular arabesque filled with dramatic harshang palmettes. Stunning allover patterns featuring symbolic devices and a latticework of angular floral sprigs are also used. Fine prayer rugs with angular mihrab patterns are made in the area as well. 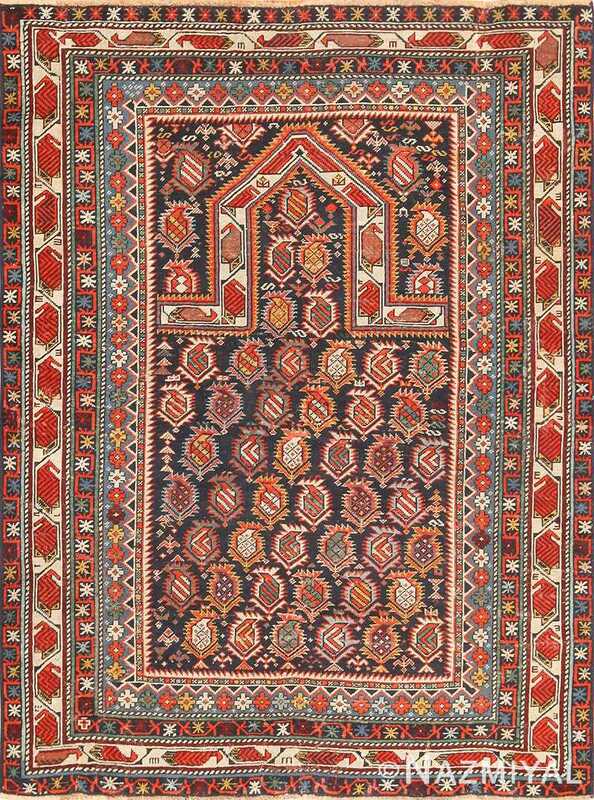 Rugs from the Shirvan region include those produced in Marasali, Bakuand other local cities and villages with the largest carpets coming from Baku. Regardless of the format or the patterns featured, antique Shirvan carpets are full of strong colors, powerful symbols and subtle details that add to their stylistic richness. 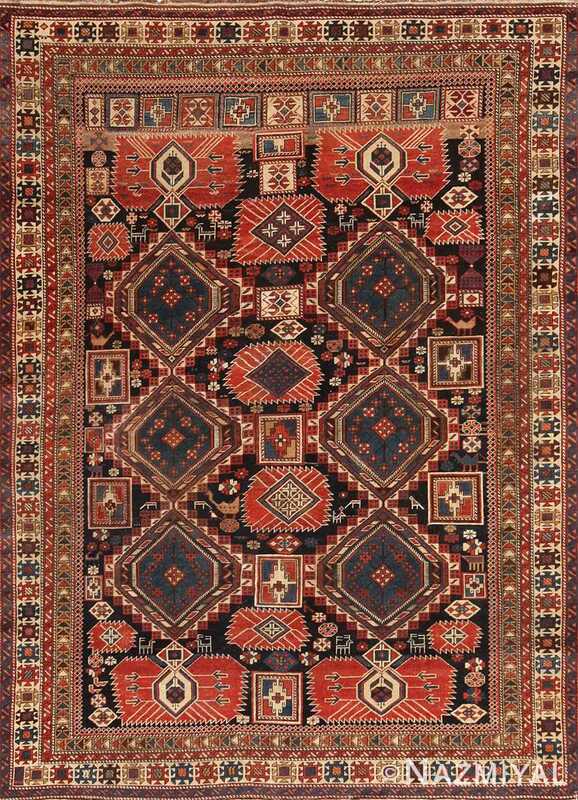 Shirvan rugs are often the most sought after antique rugs from the Caucasus. 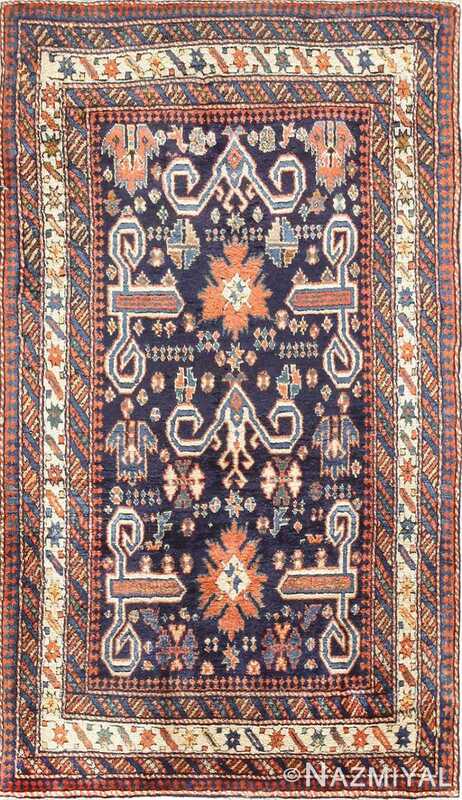 Shirvan rugs were made not far from those of Kuba, which are closely related in terms of design and coloration. But Shirvan tend to be distinguished by a larger, more supple weave. They also leaned more to medallion designs, while Kubas relied more on allover patterns. Still, Shirvan rugs and Kubas constitute something of a contrast to the bolder more graphic quality of South Caucasian rugs like Kazaks and Karabaghs. Instead they are more finely detailed, relying on precise articulations of form as well as the effects of rich color. True Caucasian Shirvan rugs are work of art combining any number of variations using a limited color palette to its maximum effect. Shirvan is an area sitting just south of the Caucasus range of mountains, between Gendje to the west and the Baku peninsula to the east. Its rich local weaving tradition is seen in the rugs that came from this region before the 1890’s. 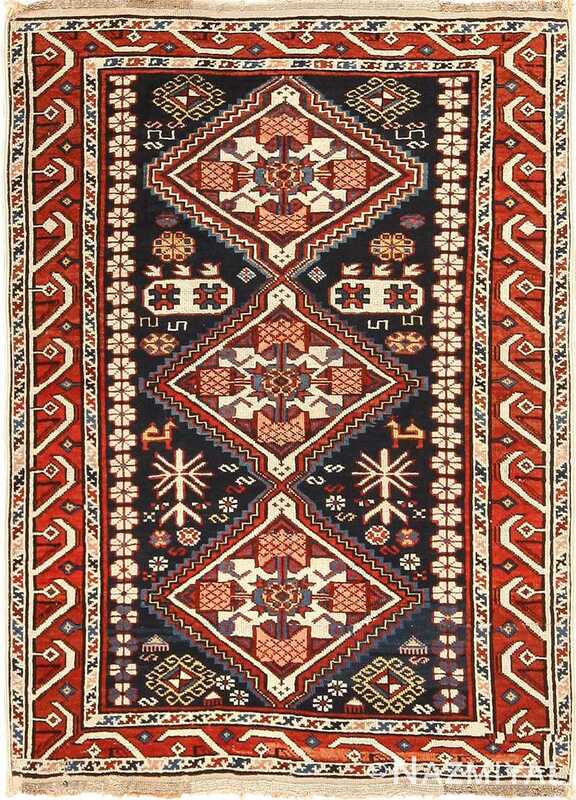 Among the most sophisticated carpets created in the Caucasus region, Shirvan area rugs and runners showcase the finely knotted handcraft used in their production. One of the most iconic things about a antique Caucasian Shirvan rugs is the elegantly simple design. Twin medallions spring forward from the deep indigo background, offering a striking graphic effect that’s both innovative and sophisticated. Every line in the rug plays a part in the effect. Each aspect of the design comes together in a natural harmony of balance and symmetry. Unfortunately, these beautiful high quality Shirvan rugs are no longer produced. They ceased to be before the turn of the 20th century. The trans Caucasian railway opened up the region in the 1870’s, creating an avenue for European dealers to come into the area with ease. These dealers came in and bought up large numbers of these distinctive rugs and took them outside the region for hungry buyers. Due to this increased demand, weavers began creating even more intricate designs, with extremely fine weaves and high knot count. The demand, however, soon outpaced the ability of the weavers to keep up. As a result, by the 1890’s, carpet weaving workshops began to replace individual weavers. Commercial rug dyes replaced traditional ones. Designs became simpler and more symmetrical. 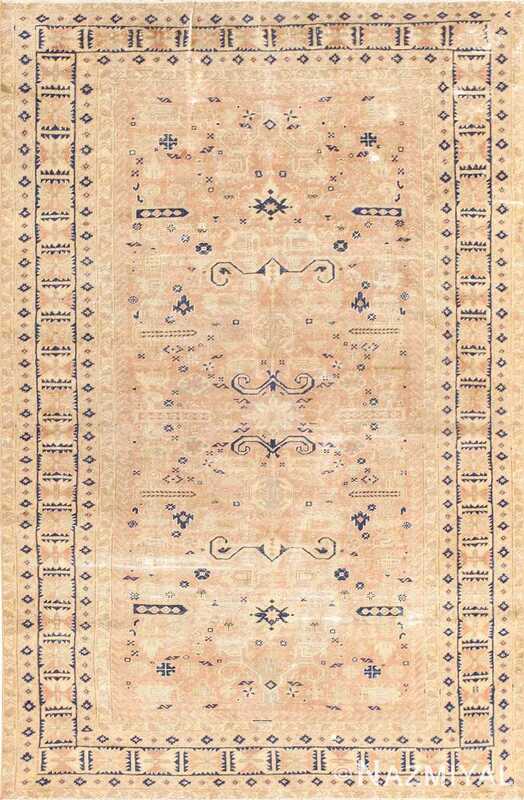 The secondary motifs in these beautiful antique rugs, though small, were excluded to simply the design. 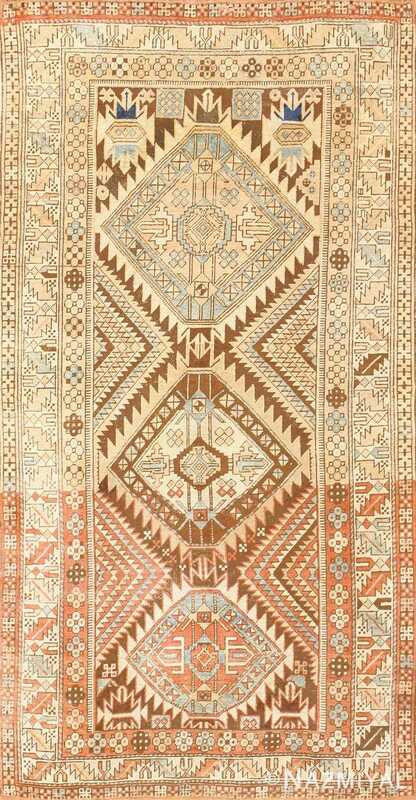 The loss of these motifs meant the loss of the individualism that marked these uniquely Shirvan rugs. This stunning antique Shirvan rug from the Caucasus features a superb stacked medallion composition augmented with symbols that typify the local style. Crafted in the late 19th century, this stunning antique Russian Shirvan runner features a graphic assortment of traditional patterns, textures and techniques. 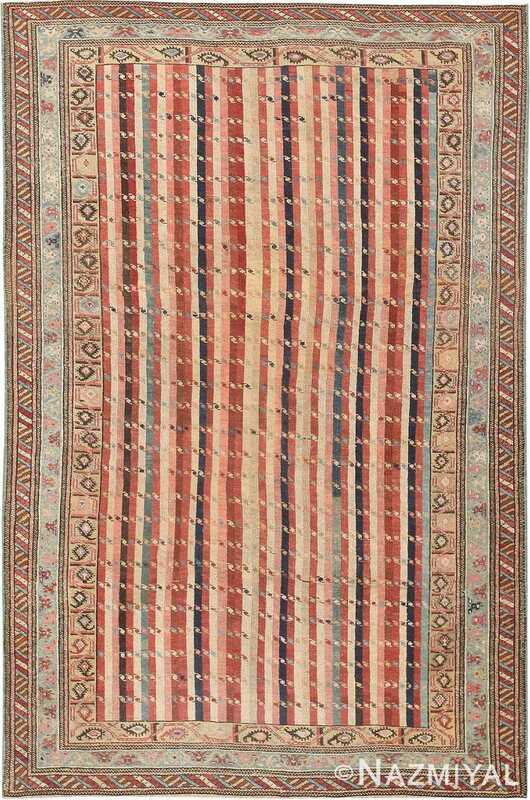 Decorative earth-tone stripes, fantastic border motifs and dainty S-hooks adorn this striped carpet from Shirvan, which represents a classic Caucasian rug type. This handsome antique Shirvan rug features a gorgeous field of deep blue, against which the tones of the tribal symbols thereupon contrast brilliantly.